Our mobile team brings grooming care to you, keeping your pets beautiful & healthy in the comfort and convenience of your home. Does Bathing Beauties come to you? We carefully inspect your pet for problems during our grooming appointment. While we are not veterinarians, we are trained by veterinarians to be observant of your pet’s skin, teeth, and ears, and alert you to potential problems that we notice. Our main goal is to pamper your pet. Let us indulge your pet as we bathe, massage, and trim, making them feel like a new pup or kitty when they return home. Our groomers lovingly provide extra attention and care in every groom. Bathing Beauties has proudly been serving South Jersey since 2001. In 2015, we were happy to announce our new partnership with HousePaws Mobile Veterinary Service. 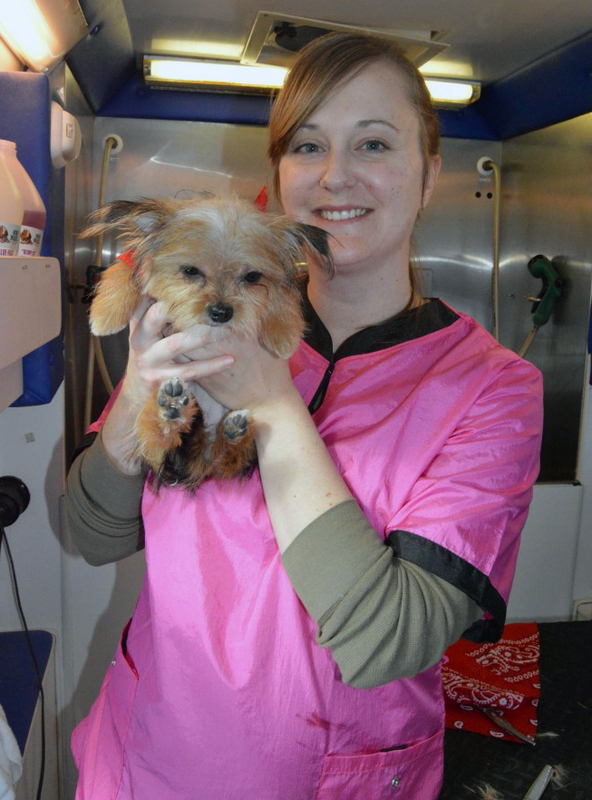 Our mobile pet groomers have over 75 years of combined experience grooming dogs, cats, and the occasional mini donkey and baby pig! With our new HousePaws team, our mobile dog groomers also gained additional training in animal CPR, early disease recognition, and more, to help keep your pet clean AND healthy. We run both as a part of your pet’s beauty regimen and as an extension of your pet’s health and care providing team. Why choose mobile pet grooming? Pets are groomed right outside of your home, and promptly returned when done. There is a reduced chance for the spread of contagious diseases, because it’s only the groomer and your pet in our grooming van which is sterilized between each appointment. The situation is low-stress for your pet, without other noisy pets or their strange smells. Your pet is never put in a crate or cage, and never left unattended under a large drier. Your carsick or anxious pets will no longer have to travel to the salon. Your pet isn’t waiting in an unfamiliar location before their grooming begins. Our groomers will provide individualized grooming plans for your pet, personalizing the maintenance plan to meet your specifications and lifestyle.